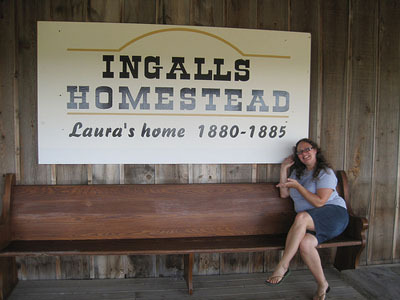 Above, me at the Laura Ingalls Wilder family homestead in De Smet, South Dakota. Hello! My name is Renata Sancken. Welcome to my online portfolio. As of summer 2016, I am in the process of backpacking around the USA and eventually relocating to the Boston area. Aside from my passion for literature and library services, my other interests include hiking and storytelling. I have been a frequent storyteller at Louisville's Moth StorySlams and have twice progressed to the annual GrandSlams. I am also the co-host of the popular book podcast The Worst Bestsellers. After I received my Master's degree from the University of Illinois at Urbana-Champaign's Graduate School of Library and Information Science, I worked as the teen services librarian at the New Albany-Floyd County Public Library from 2012-2016. I graduated from Grinnell College in 2007, where I double-majored in English and history. At Grinnell I served as the editor-in-chief of the satirical newspaper The B&S, co-led the Student Campaign for Increased Political Engagement, served on the History Student Educational Policy Committee, and generally managed to pass the time until Grinnell got Facebook. I also spent my summers working at Girl Scout camp, where I honed my patience and my ability to entertain and educate groups of children. After graduating, I worked at a private school in San Francisco in the office and afterschool program. 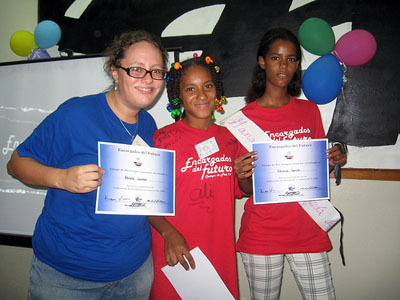 In 2008, I began my two-year service as a Peace Corps volunteer in the Dominican Republic. I worked with the DREAM Project to provide teacher training, English classes, and computer skills training to the underserved community of Callejon de la Loma. I was also the editor-in-chief of the volunteer magazine, the Gringo Grita. In the DR I learned a lot about intercultural communication and eventually managed to learn Spanish. Above, me with the girls I brought to the Encargados del Futuro (Future Leaders) youth conference in Santiago, Dominican Republic. I originally designed this website as a project for the web design class I took in summer 2011. I used TextWrangler and hand coded the HTML and CSS, both of which are W3C valid.